Table turning, table tipping, table tilting and moving tables by invisible energy means are one of the same. In Spiritual terms table tilting falls under the category of Physical Mediumship. It involves the transfer and integration of energy into a table to make it move or dance on its own accord. Table tilting works best with wooden objects such as tables, chairs or kitchen stools although other artefacts and larger pieces of furniture can and have been used. To the uninitiated it is probably quite frightening to see but once experienced through participation it is likely to be an unforgettable experience. The more it is performed with a particular object the more powerful it seems to get and the easier it is to move that object during subsequent sessions. With respect to table tilting It works best with at least two people but the more the better. The procedure is for all to sit around a table with each individual’s hands placed flat upon the table’s surface. The controlling medium will place a ring of protection around all the sitters and will ask for the highest available spirit to act as controller on the other side of life. The more each participant is relaxed the easier it will be to perform. Some participants play jolly sounding music and laugh and chat at the same time. This is thought necessary to increase the positive energy being placed into the table via each person’s hands. 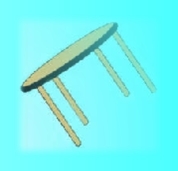 Initially, each sitter will probably feel subtle energy transitions, on the table’s surface, ranging from a slight vibration to a pulsating sensation. The next stage will most likely involve creaking noises coming from the table together with some slight movement. This may then be quickly followed by a sudden movement with the table rising off the floor straight up or more typically, at an angle. Similarly the table may rush to the other side of the room of its own accord. I’ve seen tables dance and climb walls too. Once a table is moving on its own accord the sitters should get up and follow it and at least one medium should have either a finger or a hand connected to it in order to better control it through mental means. I’ve seen extremely heavy solid oak dining room tables move at high speed across a room and I have witnessed also a group of people sitting on a travelling table where the combined weight would have exceeded 30 Stone (420 pounds). So what is the point of it all? Well, basically it is good fun and it proves that there is a lot more to this World than meets the eye. You can also ask the table various questions and the integrated spirit energy will answer but first you will need to stipulate a direction for “yes”, another for “no” and another for “maybe”. Sceptical people may think that the participants are cheating by pushing the table; all I can say regarding these doubts is to try it yourself or be a witness to it. You don’t have to be a spiritual medium to make it work but it is wise to have one in attendance just in case you attract an unwelcome spirit who will then need careful handling. Some table tops are fashioned to replicate an Ouija board. Letters from the alphabet and numbers from 0 to 9 are inscribed along the edge of the table. A pointing device such as a Planchette is used by the attending spirit(s) to answer questions from the sitters. Be warned that Ouija Boards are alright to use if you have been professionally trained to use one. If you have not been trained professionally then leave well alone because an Ouija board acts as a “public telephone” and as a result you might attract a spirit entity that has negative and influential qualities.